In New Delhi, I've tasted different types of mouthwatering snacks, and today, I'm going to write about one of them. It's quite common here and people munch it during tea time or breakfast. You can easily keep this snack in an airtight container for several months. It may be possible that you may not be having all the cooking utensils that are needed to make this recipe. In that case, you can use the alternatives I've mentioned below. You must either use mustard oil or canola oil to get the authentic taste. You must bring this snack to room temperature before serving. One can add different kinds of bean sprouts in this snack just before serving. This will add some nutritional value to this delicious snack. Do make this extremely delicious, mouthwatering and crunchy snack mixture of Indian origin consisting of flavorful spices and aroma for your tea time. Take a large bowl and mix Bengal gram flour, corn flour and rice flour in it. Take a small bowl and add chaat masala, tamarind powder, paprika, roasted cumin seeds powder, coriander seeds powder, rock salt, asafoetida, mint leaves powder, carom seeds powder and salt in it. Mix it well with a spoon and add half of its quantity in mixed flour prepared in the first step. Add lukewarm water to the flour and make tight dough. Keep aside for at least an hour. Take cooked and dried white chickpeas in a bowl and add 1/4 tsp spice mixture in it. Heat 1 tsp mustard oil in a shallow frying pan and roast seasoned chickpeas in it for about 5 minutes. Keep aside. Roast almonds, cashew nuts and peanuts on a griddle for about 5 minutes and keep aside. Take 1/4 tsp of mustard oil in a shallow pan and roast dried green peas in it with pinch of rock salt. Bring down from the flame after 3 to 4 minutes and keep aside. Peel all the potatoes and make thin finger chips from the peeler machine. Heat 3 to 4 cups of mustard oil in a deep pan. Fry thin potato fingers for about 2 minutes on a high flame and take out on a paper to absorb excess oil. Fill the mixed dough in a vermicelli making machine. Again heat 3 to 4 cups of mustard oil in a deep pan. Fry thin vermicelli through the machine and fry them for about 2 minutes on a medium flame. Place them on a paper to removes excess oil. Take a large bowl and add fried vermicelli in it. 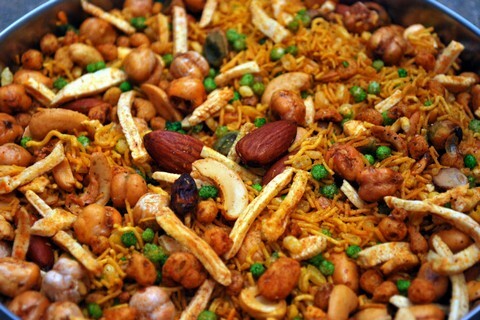 Add roasted green dried peas, roasted white chickpeas, roasted almonds, cashew nuts and peanuts in it. Add potato fingers and the remaining spice powder in it. Mix the entire snack mixture well through a wooden spatula. Fill in an airtight container and serve with tea or coffee.